This is the first muffin I baked this year in September! I have been cutting down baking to reduce sugar intake since last year. As a result, the pack of semi-sweet chocolate chips I bought from Costco was left untouched for months. Finally, I decided to bake something easy for afternoon tea. 2 kgs of chocolate chips, still a long way to go! It was my first time to use the pancake mix in baking muffin. I am glad that they turned out moist and fluffy. My boys asked me to bake again the next day, with more chocolate chips topping. For information, pancake is called hotto ke-ki (hot cake) in Japan. After living here for more than six years, I still can't get myself used to the Jap-lish. Combine the chocolate chips and butter in a heat proof bowl. Melt the chocolate with either double boil method or microwave it. Set aside. In a separated bowl, bring together the milk, water/coffee, sugar and eggs. Whisk until well combined. Add in the pancake mix and fold to mix. Add in the chocolate mixture. Fold to mix with a spatula. Spoon the batter into muffin cups, 80% full, add chocolate chips topping if desired. Bake in the preheat oven at 180°C for 25 mins. Remove from the oven and cool on rack. Cutlet is called "katsu" in Japanese, food with the word of katsu attached is referred to something fried with breadcrumbs coating. For example, ton-katsu (pork cutlet), minchi-katsu (minced cutlet), and kushi-katsu (cutlet on skewer). 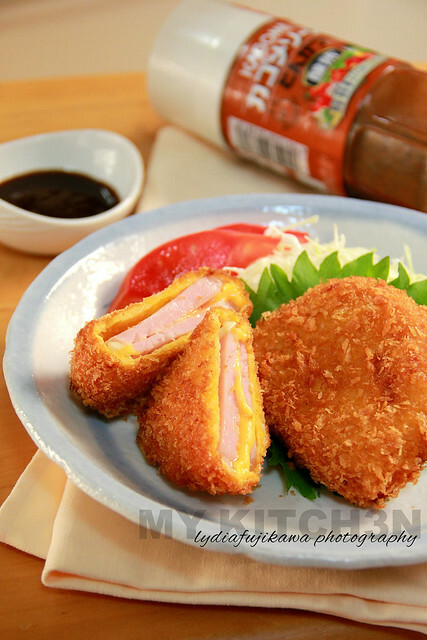 This kind of ham cutlet can be found in the supermarket's fried food area, together with other fried items like tempura and fried chicken. Katsu is often served with the Tonkatsu sauce but I prefer it plain without any sauce. I am just not a sauce person. My old and young boys love cutlet very much but only the old boy (true Japanese) eat it with Tonkatsu sauce. Hence, it is okay if you cannot find the sauce at your end. This ham cutlet goes well with steamed rice, you can also have it as the filling for your sandwich. Katsu-sando (Cutlet sandwich) is one of the popular sandwiches in Japan, for the quick lunch and obento. I made this cutlet with homemade chicken ham but any ham will do. Cut ham into 0.5cm thick slices. Sandwich slice cheese in between slices of ham, you may need to cut the cheese to fit the size of ham. For coating, prepare flour, breadcrumbs, and egg mixture in 3 separate shallow containers. Coat each ham-cheese-ham sandwich with flour, egg mixture, and breadcrumbs. Again, with egg mixture and breadcrumbs IF you prefer thick crust. Set aside for few minutes for the breadcrumbs to absorb all the moist. Preheat oil, fry cutlets with medium-high heat till they turned golden brown. Serve warm with salad and tonkatsu sauce. I realised my two boys love to eat soup, perhaps they are influenced by school's lunch? Soup is one of the popular menu in their school's lunch, such as miso soup, vegetable clear soup, Chinese style thick soup, and western style cream soup. Both my boys love to eat soup with the rice mixed in, this kind of rice is call "neko-meshi" in Japan. Neko-meshi means cat's rice literally, the food served to cat before the commercial cat food is available. This is one of my boys' favourite soups to turn into a delicious neko-meshi, they usually asked for "okawari", top-up/second serving. As for hubby and I, we like it hot with a lot of ground white pepper. Bring water to the boil, add in chicken and cook until chicken is well cooked. Remove chicken and submerge it in a bowl of iced water. Set aside. 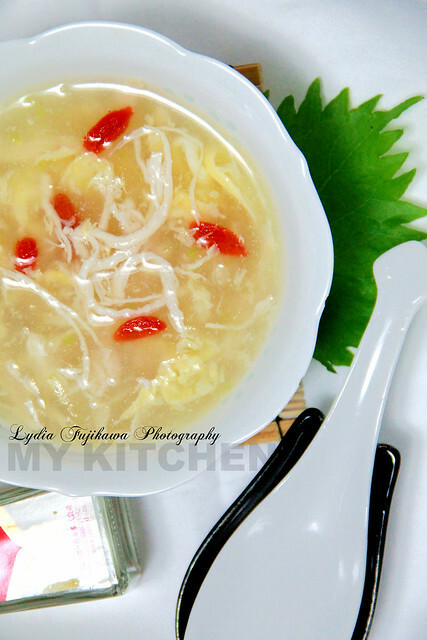 Add winter melon strips and wolfberries into the pot, cook for about 10 minutes with low-medium heat. Meanwhile, remove chicken from iced water, pat dry with paper towel and break into strips. Add chicken strips into the pot, season with salt and pepper to taste. Add in starch mixture and mix well. Add in egg in a stream and swirl the soup gently with the ladle. Transfer to serving bowls and serve warm.